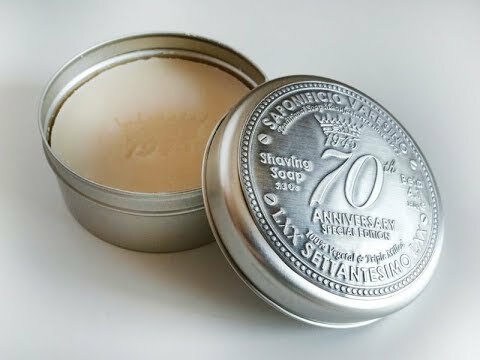 In wanting to try the Saponificio shaving soap, but I don't want to buy the expensive wooden bowl. I was wandering if this soap would fit in a 1 cup Pyrex storage container? If not any ideas without grating it? Dependent on which soap you get, it may be slightly pliable so you could tear it. But if my memory is correct, a pyrex bowl (1 cup) maybe be slightly too small but not by much. I could be wrong but I would say you'll probably be fine to just order and see when it comes how hard it is and if the puck needs trimming to fit. I want to try the Dolimiti refill soap . The pucks that come in a box fit in the standard PETG tubs that many current soap brands come in these days. Think B&M style tubs. I had an empty maca root shaving cream container and I trimmed the sides of my dolomati just slightly and it fit perfectly. Hi, no need to buy the wooden bowl. You can usually fit the pucks in most empty soap containers, but you can also grate the pucks without any problems to their performance. My fav soap is Cosmo. This has a slight hint of coffee and it lathers very well. I love Dolomiti. It was the first SV soap I bought . I bought 2 pucks of Dolomiti at a bargain price but one was more difficult to lather which certainly is not the norm. I have bought container at Walmart that will fit. Just wait till your soap arrives, then take it with you to match. No chance of you being accused of stealing the soap from a store if trying to find a container.